Seasonal coastal cuisine at L'Auberge Del Mar. 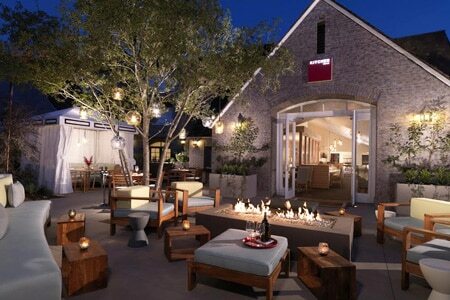 : Executive chef Nathan Lingle oversees this sophisticated restaurant in L'Auberge Del Mar. The dynamic menu focuses on coastal harvest cuisine, simply prepared, showcasing bold flavors within the changing seasons. As always, the food puts an emphasis on quality products and farm fresh ingredients. To start, there's summer squash carpaccio with goat's milk ricotta or green tomato gazpacho. Interesting entrées include rabbit loin fricassee with pea tortellini or halibut with artichokes, fennel barigoule and sea beans. Beyond the stylish main dining room, guests can dine under the stars by the fireplace or tuck into a romantic cabana for a more intimate dinner. The private wine room is the perfect spot for a special occasion meal curated by the chef and the well-versed sommelier.